Not all the surgeons needed to scrub up even though they were participating in a surgery. LVL Multimedia in Belgium rents broadcast, projection and display equipment to broadcast facility houses, production companies, event planners, sound and light companies and freelance camera operators, and recently LVL Multimedia provided the Quicklink TX Quad to transmit a live surgery session in HDTV from a hospital in Bern to Palexpo in Geneva. This was for a live medical TV program produced by ATiT, an audio-visual and information technologies company that specializes in medical video production. 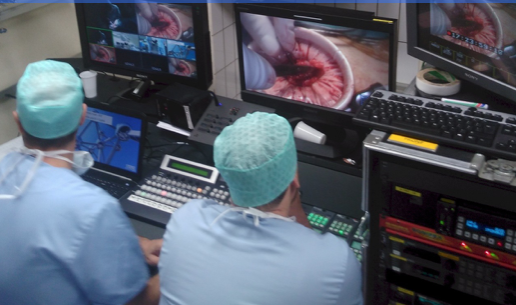 In Palexpo Geneva over a thousand specialists, surgeons and nurses followed the surgeries live on giant video screens, and at the same time were able to talk directly to the surgeons and ask them questions live on air while they were operating. During this live program, two video channels of the Quicklink TX were used. 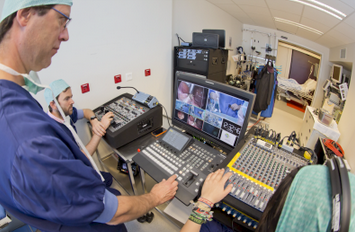 One channel for the program video in full HD1080i and audio as the back-up for the satellite channel, a second channel was used to transmit a mosaic image to enable remote monitoring of all video sources in all three operating rooms at once by the crew and presenters in Geneva. Two audio channels were also used: the first channel carried the return audio from Geneva to Bern and the second channel was used as a two-way intercom system between production crews at both locations. Stijn Vanstiphout of LVL Multimedia said that the Quicklink TX is budget friendly, and clients can make several connections with one single box. Also, there is no need to have specific IT skills and knowledge about IP-addresses and ports. He continued that they are now able to offer cost-effective connections between the broadcast-location and viewer-location without having to use an expensive or special device on the other side. Mathy Vanbuel, production director of ATiT added that until now they have been using Quicklink as the back-up for their satellite program channel, they are now seriously considering whether to use this technology in the future as the main transmission channel of their program video and audio, saving considerably on the costs of satellite transmission. This recent experience in Switzerland has demonstrated the viability and reliability of the technology. LVL Multimedia’s mobile setup includes a Quicklink TX Quad mounted into a 19-inch rack of a front and rear opening flight case. The case also includes a two-rack unit drawer, one-rack unit retractable USB keyboard and trackpad, and a 15-inch VGA monitor. The broadcast-ready case is pre-connected and ready to use. After connecting the AC and network cable, the unit is ready to boot-up, configure and broadcast.